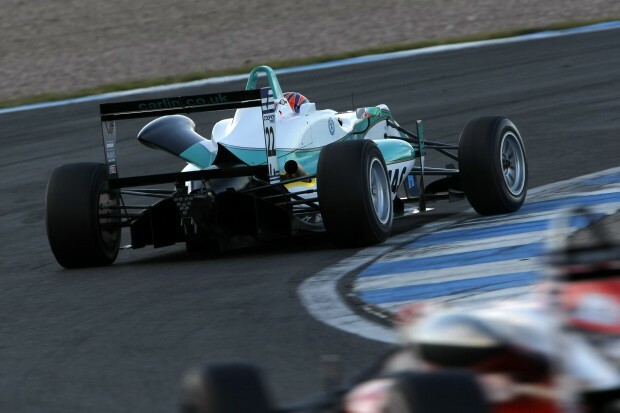 PETRONAS Talent Programme driver, Jazeman Jaafar, stayed ahead of his title rivals in the Drivers’ Championship after the first of the three races at Donington circuit in England, the final round of the 2012 British F3 International Series. A second place finish for the Malaysian driver, behind Carlin team mate Jack Harvey, kept him in the lead, although the results closed the gap between the two drivers to just one point, with the other title contender, Felix Serralles, finishing fourth to lie in third place in the championship and still able to wrest the title from Carlin. The Donington British F3 championship decider weekend began with a familiar trio of names leading the times in practice, with Jaafar, Harvey and Serralles all featuring at the top of the time sheets during the sessions. Qualifying also proved highly competitive, with Jaafar’s protagonist, team mate Harvey, taking the first spoils with a double pole. The young Malaysian was still in his sights though, posting times which put him second on the grid alongside Harvey for the first race and third on the grid for the second race. Heading into the weekend, the points table showed a gap of just six points between leader, Jaafar, on 279 points and third placed driver, Harvey, sitting on 273 points, with Fortec Motorsport rival, Felix Serralles separating the two with 276 points. Although Jaafar had left the last round at Silverstone with a large gap to Harvey, an appeal of the results of one of the races at Silverstone, had been upheld and Harvey had been reinstated with lost points to sit close behind in third. With a maximum of 20 points on offer in each race and an additional point for the fastest lap, all three drivers have the chance to take the championship title. The late afternoon opening race of the weekend featured a dry track and blustery winds, setting the scene for the fierce battle in the first of the three final races of the 2012 British F3 season. Harvey and Jaafar both made good starts to lie first and second after the opening lap, with the other driver in the hunt, Serralles, sitting in fourth place. As the race unfolded, Jaafar held position, with Harvey using the clean air to draw away from him. Third placed driver Alex Lynn was close behind Jaafar in the early stages, but the Malaysian driver gradually put more and more distance between the two. After 30 minutes of hard racing, Jaafar finished second to Harvey, closing the gap between the two drivers to just one point, with Jaafar leading on 294 points and Harvey on 293 points. The final two races of the weekend take place tomorrow. The first of these will be a semi-reverse grid format, with the eighth placed driver, Harry Tincknell, taking pole. Jaafar will line up on the fourth row of the grid in seventh place. Serralles, after finishing fourth, will be ahead of Jaafar in fifth place and Harvey will be just behind Jaafar in eighth place. The third race will round off the season tomorrow afternoon.